This month’s contribution comes from one of SOMI’s students, Nichole Hernandez, LMT. This case study and her story are quite remarkable. I met Nichole several months ago during one of our Medical Massage seminars. It was her first exposure to the science of Medical Massage and its clinical application. After the class she asked questions and we communicated via e-mail. In July she asked advice on the most effective way to treat her client with a very complex clinical history. The case was so difficult that more likely a therapist who already went through intense SOMI training could handle it. This case was so complex because somatic abnormality complicated by neurological symptoms was additionally combined with a chronic visceral pathology. Such complex cases are the most difficult challenges in the entire massage therapy profession. Truthfully, we thought there was only a very small chance that Nichole would be able to make significant improvements for this patient just because she was a novice to the entire concept. She proved us wrong. As readers will see, in just eight sessions she was able to crack a very complex case and make a huge difference in her patient’s life. This case also illustrates how everything in our body is interconnected and how important it is for therapists to see the larger picture and consider all players that may contribute to the clinical picture they are dealing with. 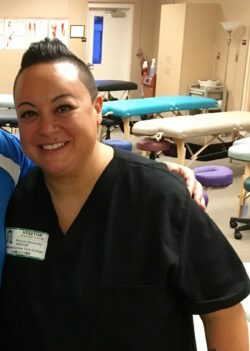 Nichole proved to us and to other therapists that clinical effectiveness of massage therapy is based not only the number of certificates, but also on professional dedication, curiosity and personal effort. This has been the most complex case that I have dealt with in my 9 years of practice. In this case study, you will notice more information that comes to light as time goes on. At the chiropractor’s office where I was working, I did not have the time to do an initial thorough evaluation. This was the system that my employer wanted me to use and therefore I complied. On July 22, a patient came in with complaints of lumbar tightness/pain that radiated to lower left extremity (primarily inner thigh) and left knee (knee being the most painful). Nerve type pain sensations were so intense that even his bed sheets would trigger sharp pain if they made contact with the leg. The patient was also not able to sleep or lie on his left side due to sensitivity in the left leg. He complained of pain when walking on the left leg. He had tightness/pain that started about 2 weeks prior, after a 3-hour drive. He could not remember doing anything physical to cause trauma or injury. The patient went and had an MRI with findings of “Stenosis” in the L2-L3 vertebral segment. Important to note – he had a past surgery twelve years ago on the L4-L5 vertebral segment. He was also prescribed muscle relaxants 3 x a day, which he had started that morning. Visual observation showed elevation of the left hip as well as right shoulder. The first part of Kibler’s technique which indicates tension in the first level of Connective Tissue Zones located in the dermis level of skin was positive bilaterally in the lumbar area. Tightness and active trigger points were detected in Lumbar Erectors, especially on the levels of L2-L4 and Quadratus Lumborum (QL) muscles. Patient could not lie in a prone position without a pillow under left knee. 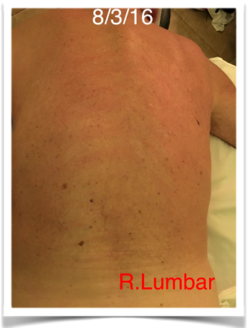 I performed the Medical Massage protocol for Erector Spinae as well as Quadratus Lumborum (QL). I also worked in Left Hip Abductors, focusing on Connective Tissue Massage & Active Friction techniques. Patient had tenderness, especially at the insertion of the gluteus medius to the greater trochanter. Performed light piriformis/hip abductor stretching. I finished with work in left hamstrings, but only for a short period of time because of the pain. Patient was light headed after session, but felt some relief. I scheduled him to come back on Monday, 7/25. 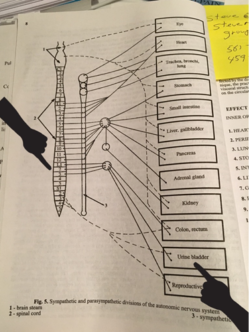 That evening I did further research and while examining the pattern of inner organ innervation by the Autonomic Nervous System or ANS (Page 8, Medical Massage, Volume I) I linked the L2 segment of the spinal cord to the Urinary Bladder (see Fig.1). I made a note to ask the patient if he was having any urinary issues. Patient returned on Monday and wanted to see the chiropractor first to get guidance on what he should do next. He was very anxious and stated that he thinks he needs surgery and wanted to see a neurologist. Patient did not want to do the massage. I was able to convince the patient to let me ask a few questions and do some quick testing. I asked the patient if he was having any urinary issues, to which he stated that he was. I asked for how long and he said about the same time that lower back and leg pain had started. His “flow” had not been that great and he was using the bathroom 4-5 times during the night. Patient also informed me that the night before, he was getting out of the hot tub and he passed out (luckily his wife was there and was able to catch him). He felt lightheaded right before getting out. My next step was to perform the Sensory Test to evaluate skin for presence of the cutaneous reflex zones within L2 and neighboring dermatomes. My goal was to detect any sign of imbalance within the Autonomic Nervous System. The application of the Sensory Test immediately confirmed the presence of Excessive Red Dermographism reaction, especially on the right. Also the patient reported feelings of scratching sensations in the lumbar region when I slightly pulled a fold of skin there. It indicated the presence of Connective Tissue Zones in the second level, i.e. in the superficial fascia. The results of Kibler’s technique, Sensory test, Dermographism reaction in combination with lightheadness indicated the overactive Parasympathetic Division of the Autonomic Nervous System. I made a picture of test results from his back, showed and explained to the patient the meaning presented in Fig. 1 as well as correlation of Autonomic Nervous System on the level of L2 to the function of Urinary Bladder. I explained to him the difference between Sympathetic and Parasympathetic Nervous Systems and the possible response of his Peripheral Nervous System to possible imbalance in their functions. All testing I did led me to believe that imbalance in his Autonomic Nervous System may also have triggered secondary abnormalities in the function of the peripheral nervous system which showed as a neurological pain to his knee. This was the most insight he had in two weeks of seeing various health practitioners. He was grateful and scheduled to come in for a session on Wednesday, 7/27/16. The next morning, I called the patient to tell him that I thought it would be wise to see a urologist and make sure nothing was going on in his urinary bladder. He informed me that he had just left the urologist’s office. He then told me that he was on Uroxatral for several years because of his enlarged prostate. Uroxatral helps relax the muscles in the prostate and bladder neck, making it easier to urinate. It is used to improve urination in men with enlarged prostate. The urologist thought that his medication may be over relaxing the urinary bladder and the doctor then switched his medication to Flomax. The urologist’s assumption additionally reinforced my original idea of imbalance within ANS. I finally had some answers to the information I gathered so far. This looked to be a case of reflex zones formed in the soft tissues as a response to the chronic visceral pathology (enlarged prostate). Now it was time to develop a plan of action to get his Autonomic Nervous System back in balance and subdue the activity of the Peripheral Nervous System and get rid the pain in the lumbar, left leg, and knee. With the help and guidance of my mentors: Jeff Wood, LMT, B.S. and Dr. Ross Turchaninov, MD I was able to come up with a plan of action with protocols to address this case. I was advised to combine elements of protocols I previously used (Femoral Nerve Neuralgia, Lumbar Erectors and QL) in one session and concentrate on the skin and fascia more, as well as application of Segment Reflex Massage. I had just finished my first 24 hours of Medical Massage training in June, and now I was having to jump into visceral pathologies?! I was very nervous, eager, and overall hopeful to help this patient…I also wanted to test for myself and others if Medical Massage works! Dermographism Reaction to the Sensory Test is shown in the Fig. 2. Sensory Test in the area of the distribution of Femoral Nerve innervation was negative. The patient reported that the intensity of skin stimulation “feels the same on both thighs.” A Compression Test for the femoral nerve involvement was positive. Tenderness along the Rectus Femoris and Vastus Medialis was present. The session did not start out as well as I had hoped. His pain was so intense that the sheets rubbing on his leg were causing pain. The patient was very anxious and uncomfortable. About 10 minutes into the massage, when working in lumbar erectors using segment reflex massage, he had extreme pain in the left knee and was no longer able to lie prone. We switched to supine position and I started to focus on adductors/quads with effleurage, kneading, Connective Tissue Massage, friction, skin rolling & lymph drainage. Again, extremely painful and the patient wanted to stop. During PIR stretching of quads, the left knee made a loud pop but caused no pain. We went back to prone position and I was able to work on erectors and QL, hip abductors, hamstrings. Patient stated he almost fell asleep. I finished on sideline working QL with some light PIR stretching. When we ended, he did not feel pain, as pain was always constant. He was lightheaded at the end of the session. When he left the office, he was still limping out to his car. I checked in with him the next morning and he stated that he had no pain relief. Unfortunately, I was leaving the country and would not be able to see him until 8/3/16. He saw a neurologist on 7/29 and got an epidural injection on 8/1/16. The neurologist suggested to continue with the therapy and advised him that he was not ready for surgery. I returned and followed up with my patient on 8/2 and he still had no relief, even with the epidural injection. We were set for him to start sessions in the office on 8/3 and 8/5. I knew he needed one more consecutive session on 8/7. I offered the Sunday session at his home for FREE (since I left the country), therefore not allowing the consecutive sessions needed for the course of Medical Massage. I was advised by Dr. Ross to completely avoid provocations of pain analyzing systems in each area I was working on, (inner thigh, quadriceps). In other words, to avoid ANY chance of pain generation in already hypersensitive areas. As Dr. Ross also mentioned: if the connective tissue is flared up, be sure not to activate that layer of tissue. Also, make sure the patient does light repetitive movements and stretchings in the swimming pool. The reason a patient will feel better in the water is because the force of gravity is one of the main factors which affect muscle imbalance. Tensed muscles will have less tension, which will then irritate the nerve less if there is NO force of gravity. Dermographism Reaction to the Sensory Test is shown in Fig. 3. It is slightly less prominent. Kibler’s technique showed that fibrotic bridges are shortened and tight bi-laterally in the lower back. Session went much better. Patient reports that the change in prescription to Flomax is helping his urine bladder function, especially with frequent urination during the night. For the first time the patient was able to lie prone without pain in his knee. For this session I referred to Medical Massage Vol II (pages 270-279), as well as protocol for Femoral Nerve Neuralgia, erectors/QL while avoiding adductors/quadriceps. I focused on the sacrum, hip abductors/flexors and iliotibial band with Connective Tissue Massage, skin rolling, manual vibration and friction. Patient responded well to all techniques and reported no pain in iliopsoas. I ended with PIR stretching – passive stretching of ES group with patient supine, stretching the lower back and both lower extremities. Then passive stretching of iliopsoas (Medical Massage, Volume I, Pg. 272, Fig.186). Patient reported pain in quadriceps. Note to continue pool exercises daily. Dermographism Reaction is the same. Kibler’s technique confirmed that fibrotic bridges are still shortened and tight. Patient reports an improvement. Less pain and less irritation on the leg. Performed same protocols. Added compression to SI joints with patient’s exhale. While working in lumbar, patient fell asleep and stayed asleep for 30 minutes… snoring on the table. This may have been the most rewarding session of my entire career! Ended massage with PIR stretching. (Passive stretching of the lower back and both lower extremities.) Note to continue pool exercises daily. Patient reports feeling 65% better. Reported that he can finally walk with his weight on his left leg. Patient’s gait looks much better with no notable signs of limping. Patient states he was able to sleep on his left side without pain in the leg so his sleep has improved (sleeping 8 hours). Patient is no longer taking muscle relaxants. He is very happy and feeling much better. Performed same protocols. Was able to work more in the quadriceps, but adductors are still sensitive. Finished with PIR stretching. (Passive stretching the lower back and both lower extremities.) Continuing pool exercises daily. Dermographism Reaction to the Sensory Test is shown in Fig. 4. The absence of the Dermographism Reaction with repetitive stimulation of L2 and neighboring dermatomes proved that balance within ANS was restored. This fact was confirmed by results of Kibler’s technique application since fibrotic bridges are lengthened and tension in the first and second levels of Connective Tissue Zones started to melt away. Patient has no pain with testing. Patient is extremely happy and is feeling much better. Less pain and tightness. Still sleeping well. Patient had one acupuncture session, but did not notice much difference. Patient has finally booked a trip that he was supposed to be enjoying all summer, but due to his circumstances, was not physically able. Patient still has trigger points in erectors and QL, but nowhere near as active and painful as a week ago. Performed same protocols, continuing to focus on skin and fascia. CTM as well with high friction in sacrum. Segment reflex in thoracic and lumbar. Compression to SI joints with patient’s exhale. Work in iliotibial band, quadriceps, hip abductors. Ended with PIR stretching. Patient had an entire week break in treatment and noticed that he was doing well. Had a little bit of pain in lumbar over the weekend from getting in and out of the car for his business. Nothing out of the ordinary or anywhere near a few weeks ago. Still some sensitivity in inner thigh. 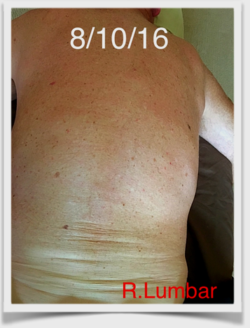 Patient had another acupuncture session on 8/16 and noticed some relief in muscle tension. Feeling 80-85% better, and is so thankful. Patient leaves tomorrow for vacation for 3 weeks. No abnormal Dermogrpahism reaction on the skin detected. Performed same protocols. Worked with patient in sideline position for longer period of time focusing on QL using Connective Tissue Massage, skin rolling & friction along erectors, QL, hip abductors. Work to iliotibial band and quadriceps. PIR stretching of back extension with sheet. 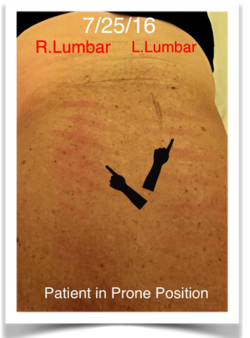 Patient reported no pain during stretch. PIR lateral flexion of QL, Rotation of QL. Will keep in contact with patient while he is on vacation. Will setup for maintenance session after 9/3/16. My patient is now a strong believer in the clinical power of Medical Massage. I hope this case study will help other therapists. It has definitely changed my way of working and thinking as a massage therapist. This was my first big case involving Medical Massage. I was able to prove that it works and overall that I can do it. My biggest asset was reading my Medical Massage textbooks, researching, watching the Video Library over and over on www.scienceofmassage.com, as well as reaching out to my mentors and asking the questions about things I did not know or was unsure of. I remember how nervous and discouraged I was when my patient did not get immediate results after 2 sessions. I am pleased that I was able to help him, with the help of Dr. Ross Turchaninov and Jeff Wood. I am so grateful for their guidance in helping me conquer this case. I have been a massage therapist for 9 years. I attended Withlacoochee Technical Institute and graduated in 2007. I have worked in the chiropractic setting for 3 years and have been mobile for 6. I have worked primarily with car accident and sports injury/therapy, overall pain and stress reduction. I have had a broad range of clients from 94 years of age to high school athletes. I have worked with a high school football team, as well as a few professional athletes. In my past work I have focused on deep tissue, trigger point therapy, stretching, oscillation techniques, rhythmic articulation, active/passive range of motion stretching and myofascial release. My approach to massage therapy has changed tremendously since taking my first seminar with Dr. Ross Turchaninov. Medical Massage is something that has changed my way of thinking as a massage therapist and I am excited for my future in the Medical Massage industry. I love helping people. The best part of being a massage therapist is the reward that comes with it. I thrive on results! My goal is to always be learning my practice. I love hearing from patients about the positive results they get from my sessions…it is my motivation to continue helping, one client at a time. I currently reside in Delray Beach, Florida with my partner and our 2 rescued Greyhounds.